Redwood Park Golf Club is one of many fantastic golfing destinations in the Harbour. The North Harbour Golf Association and District is blessed with stunning Golf courses and spectacular scenery. The region is nestled between the Tasman and Pacific Oceans. The rugged surrounds of the Tasman Ocean, you will find the Muriwai Links Golf Club. Staying west, nestled in New Zealand’s finest native plants is the Waitakere Golf Course, Redwood Park and Helensville Golf Club. Then drive through the Auckland motor interchange, via the Harbour bridge and navigate your way north to witness the coastal views of the Hibiscus Coast where Whangaparoa, Peninsula, and Gulf Harbour Golf Club’s are situated. Then drive North to view Matakana Golf – the food and wine bowl for the region. This is where you will find Warkworth Golf Club, and driving East the superb links course Omaha Golf Club. Golfer Pacific recommends that you come and try these diverse and affordable golf courses. The Helensville District Golf Club offers an easy-walking 18 hole championship course. It is situated in a scenic rural atmosphere just 35km north of Auckland on state highway 16. This par 71 course is undulating with water features and many stands of trees. The club house overlooks the course and welcomes all visitors. Please book ahead. Welcome to Omaha Beach Golf Club. Yes! There is golf at the end of the tunnel and less than an hour from Auckland, this 18 hole all weather golf course is ready for play. Considered by a growing number of serious golfers as a hidden treasure in New Zealand, the 18 hole, par 70 Omaha Beach Golf Club is less than an hour’s drive from central Auckland or an hour and a half from Auckland International Airport, but a world away from the frenetic pace of the city. It’s a links style resort course, crafted by its designers to make the most of its stunning seaside location and the gentle, undulating roll of the rural landscape into which it neatly sits. Bordered by the sea on one side and a natural estuary on the other, it is a course that offers some unique and pleasant surprises as you travel around it; a Totara Grove adjacent to one hole, a stand of Kaihikatea providing shelter to a boardwalk that delivers you to another, and with the estuary itself providing a new landscape, and challenge, as you progress around the course.Significant work has gone into Omaha over the last five years to deliver a near all seasons course that is now gaining growing recognition for its stunning beauty as much as its challenges for all levels of golfer. Which means we can promise at least two things: the warmest of welcomes and a day to remember. So often golfers say that they have never played at Redwood Park and yet so many players love the course as it provides variety and challenge. Recent comments on Google have included: “really nice parkland golf course with some interesting hole layouts”, and “well maintained golf course in a quiet area of west Auckland”. 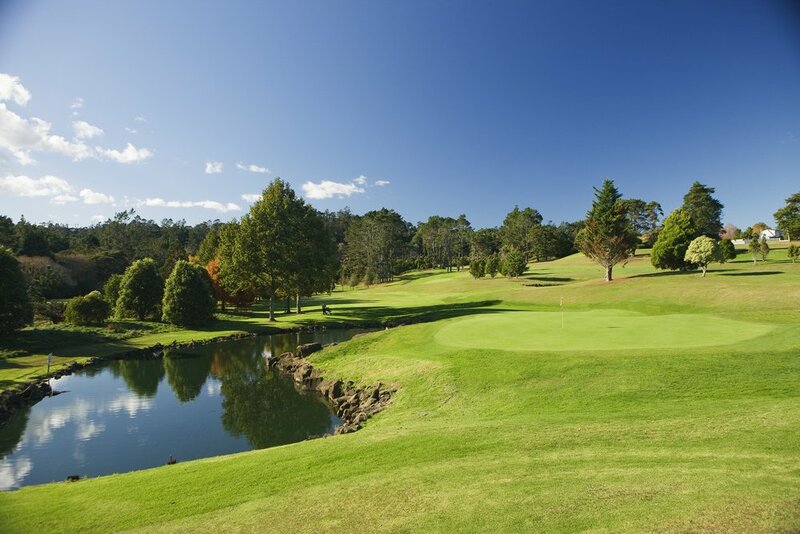 Redwood Park Golf Club is located in Swanson, on beautiful parkland in the foothills of the Waitakere Ranges. It is a 5 minute walk from the Swanson Train Station on the Western Rail Line, and a 25 minute drive from Central Auckland, via State Highway 16 motorway. It is one of the most affordable golf clubs to play at and belong to in Auckland. Call 09 8338253 or download the ‘Redwood Park Golf Club’ app from Google play or the Apple App store. Waitakere Golf Club: If you are looking for some spectacular golf and great deals to go with it, you have come to the right place. Come and enjoy a game on Auckland’s secret 18 hole course, a challenging, yet enjoyable round of golf. Tucked away in the Waitakere Ranges, the scenery and sweeping vistas will only enhance your game and the memories of your day will stay forever. We can put together golf experiences to suit from couples to large groups – just call or email the office. Overseas visitors are most welcome and unlike some courses, we don’t charge extra on green fees just because you are not a kiwi! We can help with cart and club hire, a golf shop stocked with essentials and at the end of your round relax in a lounge with stunning views and have a relaxing drink and a snack. The question on everyone’s lips is where is WARKWORTH GOLF CLUB? We are in the heart of the Matakana Wine Country, close to the beaches and all the other activities on the Kowhai Coast. Stay at Matakana Outback , then enjoy a peaceful walk in the country, play a little golf and breathe the fresh air and maybe have some refreshments afterwards. Looking for a game, we are running specials in August on Fridays $25, Sundays $ 25 Mondays $ 20. Look for us at www.warkworthgolfclub.co.nz it will be well worth the effort. Whangaparoa Golf Club is located near the end of the Whangaparaoa peninsula. Set in picturesque surroundings with parkland and ocean views, Whangaparaoa Golf Club’s 18 hole course is enjoyed by members and guests all year round. Enjoy playing on one of Auckland’s top golf courses with our affordable and competitive membership prices. New members and casual green fee players are always welcome. Whangaparaoa Golf Club hosts corporate and charity golf days, with the beverage, catering and venue facilities being ideal for special events, conferences, weddings and special occasions. Our club house and function centre offers stunning views, space and a welcoming and professional service. Waitemata Golf Club was founded in 1905 and is situated in the historic village of Devonport. The 18 hole course contour is flat, allowing easy walking through beautiful parklike surroundings with well established trees, shrubs and water features. Non playing publicmay walk through our course. Please share with care. A breeding ground for talent, Waitemata has produced national champions. Currently our trophy cabinet holds the 2015 Women’s A, Women’s B and Women’s Midweek Pennant Trophies. This is a very popular course and bookings are essential. We have redeveloped our website to give you easy access to everything you need, from booking your next tee time, accessing information on your handicap and more. Gulf Harbour Country Club is focused on delivering value to its members with first-rate product and services. As a golf course, Gulf Harbour Country Club rates in the top ten in the country by most critics and provides a golfing experience that is truly world-class. As a country club, Gulf Harbour Country Club has a wide range of facilities for use by its members. In addition, the food and beverage service is second to none, with monthly dining experiences as well as special member functions and events. Gulf Harbour Country Club is a destination course for golfers from New Zealand and around the world. Our visitors are our guests and will be treated to a golfing experience that lives up to the expectations of playing a Robert Trent Jones Jr design, matched by personal friendly customer service. Gulf Harbour Country Club is function and events facility, catering from the smallest of requirements to the largest as possible. We host private family celebrations such as birthdays and anniversaries, weddings of all shapes and sizes, through to business retreats and corporate golf days, along with high profile golfing events including two New Zealand Opens. Coupled with two multi-sport courts and a nine hole short course with holes ranging from 65 – 135 metres in length whether you’re new to the game, a scratch player, or a social player and merely enjoy healthy outdoor activity there is truly something for everyone. Located on Auckland’s beautiful North Shore, just 10 minutes from the city, the club boasts spectacular views and a challenging course. Pupuke nurtured 2 of New Zealand’s finest golfers, Lydia Ko and Michael Hendry. Come and play that course that creates Champions. Set close to native bush with strategically placed feature trees, the course winds through woods and opens up to beautiful views of the Hauraki Gulf. While not of great length, the serious player has to develop the widest variety of stroke making skills while enjoying the spectacular views. Although this is a members club, we do welcome all visitors and trust they will enjoy the golf, the views and our facilities. The clubhouse is strategically situated in an elevated position with views over the surrounding course and features a lounge with food outlets and a fully stocked bar. The club is a great escape from the hustle and bustle of the city. We also cater to corporate clients who want a quick yet convenient getaway.